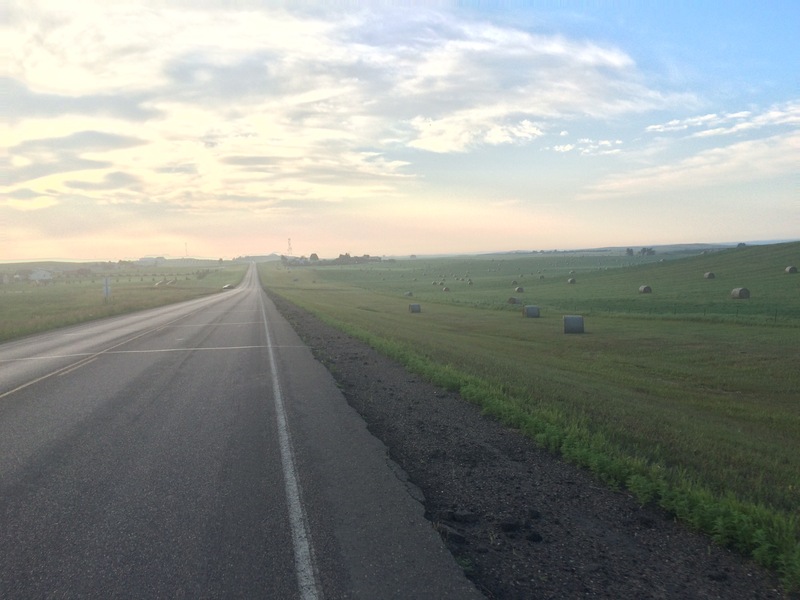 Day 31, 7/14, Dickinson, ND to Bismarck, ND: 112.7 miles, 3,672 ft. elevation gain, 14 mph average speed. We rode 100+ miles twice in two days! We’re exhausted, but we know we’ve done 3-4 days’ worth of hard, hilly riding in 2 days, which is helpful because we’re still trying to make up time. And today’s century was unassisted – there was little to no wind, good or bad. We got an early start again. Yet again, Ted pulled the bulk of the breaking-down-camp weight while I reluctantly rolled out of the tent. I got off to a grumpy start. I knew we needed to get to Bismark today because we needed to visit the Verizon store, so I had that weight on my shoulders. And at the beginning of the day, the miles tick by so slowly that it feels like we’re never going to make it. Also, for the first time since Whitefish, I had to use my four-year-old bike shorts, well-worn and insufficiently cushioned, because my new squishy ones were not dry from last night’s washing. Immediate pain. So frustrating. 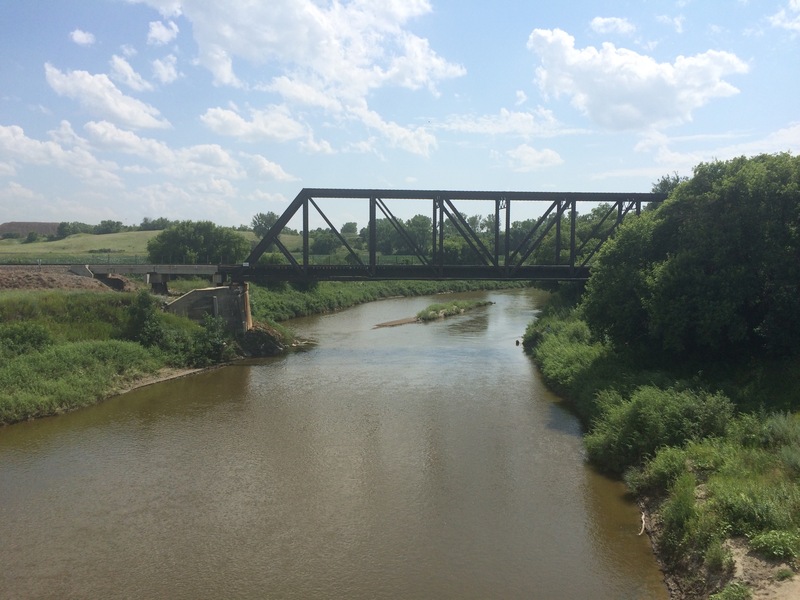 We rode on Old Highway 10 for the first 51 miles of the day, and it brought us through beautiful rolling farmland and a couple two-horse towns. We stopped for breakfast at picnic benches in Richardton, a town dominated by a Benedictine monastery and a grain elevator, of course. 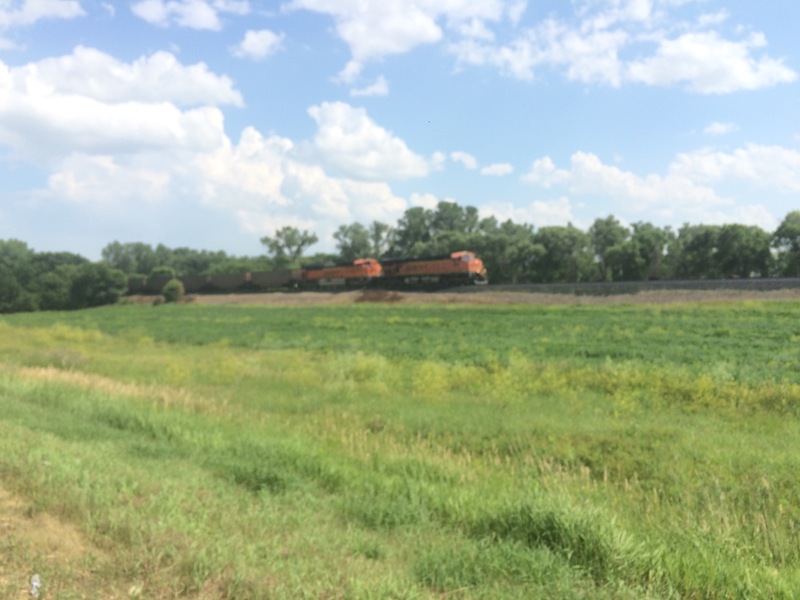 We saw a grain elevator pouring grain into a train car the other day and finally realized why all of the grain elevators are on railroad tracks. Add this to the list of things we city kids are learning about rural America. We crossed into central time, then stopped a bit later in Glen Ullin and bought two liters of orange juice and a cinnamon roll to supplement our PB & J / tuna and cheese on triscuits for lunch. I forgot to mention that the second we entered North Dakota, the majority of locals’ accents shifted to the stereotypical North Dakota accent. I wouldn’t think a state border would make such a difference in regional accents. The lady checking us out at the supermarket made lots of exaggerated vowel sounds. It was adorable. We continued onto I-94 after lunch. 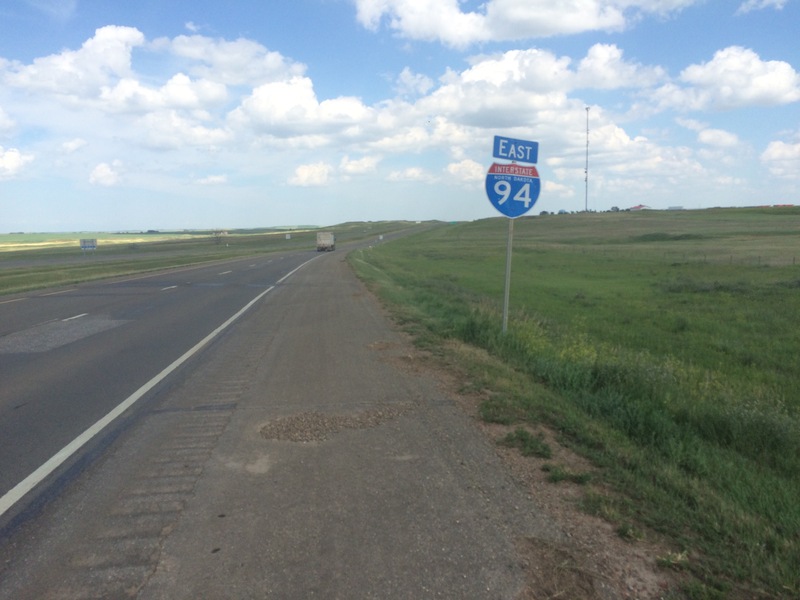 Every bike tourist we meet seems to hate interstate riding, but I enjoy how efficient it is on these longer days and the shoulder is enormous, so I feel pretty safe, or at least safer than I did on those busier highways with 70 mph speed limits and no shoulder in Montana. I think it’s the combination of gentler grades and subconsciously feeling I have to ride faster when speed limits are higher and traffic is faster, but we always increase our speed significantly on the highway. We also rarely stop because few things are less pleasant than being passed within six feet of vehicles driving 85 mph. The miles ticked by really quickly, but highway riding is scary, despite the huge shoulder. Trucks barrel past and there are debris everywhere from previous tire failures, crashes, etc. that get your mind going about all of the bad things that could potentially happen. Luckily, they had the left lane blocked off for road work for a bit, so we rode over there for 10 miles or so. Another thing about interstate riding: you end up with above average amounts of tiny bugs and road grime all over you. The thing that happens to your windshield happens to your body when you’re on a bike. We’ve been extra grateful for showers on days like these. 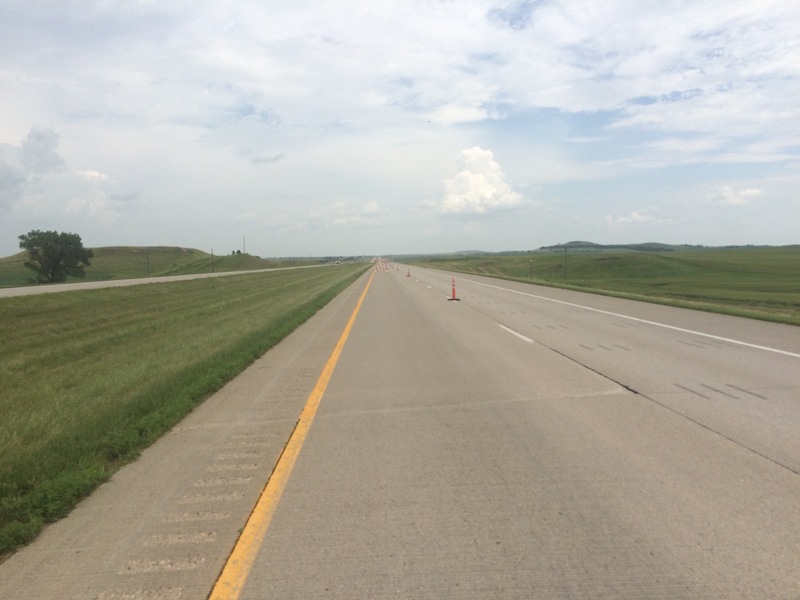 We stayed on the interstate past when we were supposed to because the actual route added several miles that we assumed were hillier with steeper grades, which is generally a safe assumption. We got off at route 25, drank cold drinks and shared a footling sub at a gas station, then proceeded to town. Bismark is the largest town we’ve seen since Seattle (population: 60,000) and still no T-Mobile coverage! We decided a week ago that we’d switch to Verizon when we heard they were running a promotion to give $300 to each person who switches back to Verizon after having switched away at some point. I think they’re calling it the “switchers remorse” promotion, so we’re perfect candidates. I’ve been fed up with T-Mobile since, during a phone interview a week after switching from Verizon to T-Mobile, my phone dropped the call 5 times and when I was connected, the interviewer could barely hear me. Where was I, you ask? Some peewilly town in the middle of nowhere? No. I was in Greenwich Village. If T-Mobile works anywhere on the planet, it should work in Manhattan. We rolled up to the Verizon store sweaty and smelly (and with bugs and filth all over us) so I’m sure they weren’t too excited to see us. They were very friendly, though, and even let us refill our water bottles in the employee lounge! We quickly got our phones and headed to treat ourselves to a motel stay as a reward for a very difficult week. 731 miles in 8 days, an average of 91.4 miles a day! Bismark seemed like a nice town. We rode past what appeared to be a small town Main Street with lots of cute shops and restaurants, and a brewery we wanted to try, but were too hot, exhausted, and grimy to stop. There were beautiful parks and bungalows in the area around the governor’s mansion. There’s also a massive dedicated bike path going all the way from the suburb of Mandan through town, with a couple spurs. I think it was called the Millenium trail. We showered the bugs off, ate pizza for dinner at one of the world’s few remaining sit-down Pizza Huts, and then returned to the hotel with a half gallon of chocolate milk to set up our new phones and bask in the luxury of air conditioning, TV, and a comfy bed. Side note: We’re getting some pretty great tans on this trip. 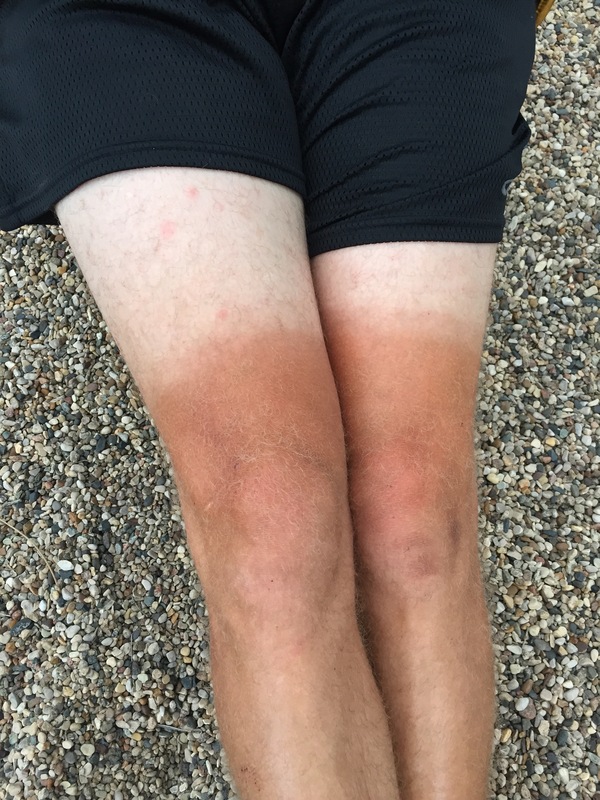 Here’s a picture of Ted’s bike shorts tan. I’m pretty sure he’ll have it for a couple years. 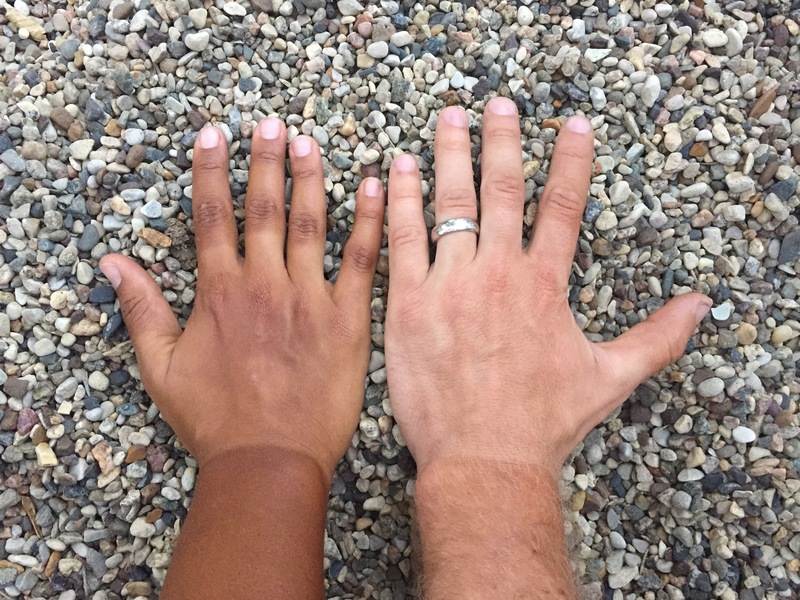 Below that is a picture of our more conspicuous, more embarrassing glove tans. If you look closely you can see the Pearl Izumi logo emblazoned on the center of my hand.